On the occasion of joint holidays in New Zealand from 20 to 30 December 2001 on North Island 5 caves on the Puketiti Station were worked on. Three of these were new discoveries, in another known cave new parts could be worked on. 8 members of the Arge Grabenstetten as well as one member of the Auckland Speleo Group (ASG) joined the explorations. In total, 2,450 meters were measured, 500 of which were virgin passages. The area of the Puketiti Station is found 180 kilometers south of Auckland and 40 kilometers to the south-west of the known cave region of Waitomo. The farm can be reached without problems on solid roads via the village of Piopio. The last 10 kilometers is dirt road and it ends at the farm. The hilly farmland (Sea level 180-380 m) is streaked by many valleys without discharge. 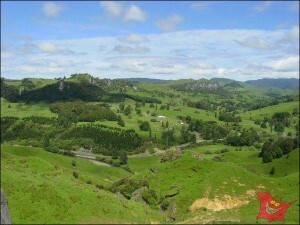 The karst area of Puketiti Station is limited by the Mangaorongo Stream in the west and the Mangaotaki River in the north and east. All five of the water bearing caves which we worked on drain towards Mangaotaki River. This cave was navigated only on 30 December, unfortunately too late for further operations. We could only do some first work on two side corridors 240 meters of new land) and by a partly new measuring (920 meters) of the main corridor put these together. It was clear during this first navigation that the cave has an immense potential of unexplored and moreover un-measured (side) corridors. Known so far were 1,800 m of corridors. 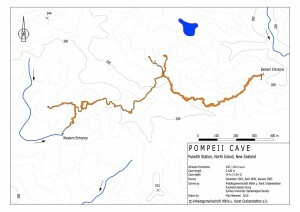 Adding our side corridors the cave has a length of 2,000 m.
Pompeii Cave is an active water bearing cave with at least 2 entrances, the so-called ponor entrance and the spring entrance. At the time we went in the brook certainly had risen to 100 l/s. The Ponor entrance area, which we used, is rather maze-like and small but there is no need to crawl or even squirm. After about 100 m the corridor gets quickly larger and then remains about 3-6 m and 5-15 m high throughout the whole main corridor. Few lintels need to climbed, other than that the clayey and sandy cave brook can easily be navigated. Mainly in the mid-part of the main corridor many a time lintels in the ceiling area appear which make the corridor itself lower; these ceiling areas should be explored with regards to potential extensions. But also at brook level left and right some side corridors set out, partly with small water inflow and ventilation which are not mentioned in the old plan (Crossley 1970). The new side passages both lead to the north and represent water inlets. The side corridor in the middle of the cave is mostly 2 m wide and 3-4 m high, however characterized by lintels. Numerous areas requiring climbing or crawling make the moving demanding. The current end lies is such a lintel area. The side entrance near the ponor entrance is mostly 3-7 m high and 2-5 m wide. Large areas of the corridor are partly filled with clayey layers up to 2 meters high in which the water course built a 0.5-1 m wide meander-like clay canyon. At the end the corridors becomes narrow in a way which makes a passage impossible. Washed-in pieces of wood as well as cattle bone and sheep bone suggest another ponor entrance. This very spacious cave lies not quite a kilometer east of Puketiti Station and was measured by us at the beginning of the time on the Station to some extent. The cave is 420 m long. In the ravine that follows there are 3 more rock gates, two of which were considered as well on the occasion of the measuring done outside (360 m). Worth remarking is the main corridor of the Grand Canyon Cave which is spacious all the way. It leads through a ridge without branches or side corridors. In former times it was apparently even used as a road since ruts are still visible. This cave which was given to the State of New Zealand by Puketiti Station is important mainly because of the colony of long tailed bats that has found a home here. The cave is a natural landmark and is looked after by the Department of Conservation. Cave tours are therefore only possible with permission – which was given to us by the Area Manager on December 24!